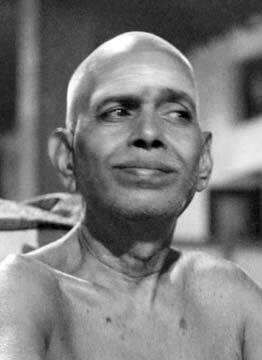 Once Sri Ramana was asked, “How does a grihastha (householder) fare in the scheme of Moksha (liberation)?” The Maharshi said, “The obstacle is the mind. It must be got over whether at home or in the forest. Renunciation is always in the mind, not in going to the forest or solitary places, or giving up one’s duties. The main thing is to see that the mind does not turn outward but inward.” (Talk 54). Bhagavan Ramana repeated this idea in a number of conversations. The Essential message is that it is not one’s station in life or one’s geographical location but the maturity of the mind that is most critical in achieving Self-Realization. Sri Ramana used to say that the mind is like our shadow. Wherever we go, we take our mind with us. One can be in perfect solitude surrounded by beautiful woods and flowers and a nice climate. Yet the mind may be distracted, worried, anxious, and troubled and be assailed by thought after thought. Sri Ramana emphasizes that the true renunciation does not involve going to some special place like a forest or ashram to meditate. The real giving up is letting go of the ego, the sense of doership, the identification with our mental fluctuations due to attachments and expectations. Fundamentally, when we give up the idea of gain and loss and turn the mind within to its source in the Heart, and surrender without reservation, that is the ultimate renunciation. Self is then recognized as the immediate presence shining by its own light as our very own Being. Pure Being. “The obstacle is the mind. It must be got over whether at home or in the forest. Renunciation is always in the mind, not in going to the forest or solitary places, or giving up one’s duties. The main thing is to see that the mind does not turn outward but inward.” Ramana Maharshi. Read more of this profound post – and thank you Dr. Harsh Luthar and Richard Clarke for sharing! It is so true. We carry our minds wherever we go. It does not matter what role we play in life, but how we play it. It is all illusion anyway. Swami Satchidananda told a story about a man who decided to renounce the world, and retire to a cave. He lived there for many years until, one day, he decided to emerge. He blissfully sat on a rock to meditate when a bird landed on a tree branch close by, and started to sing. The acetic looked up at the bird with angry indignation for disturbing his meditation. The bird then fell dead as a result of the man’s anger. A rishi passing by noticed what just happened. He went over to the acetic, and asked him: “What good is your seclusion if you get so angry? It was just a bird being itself. Go, and find your Self by accepting everything and everybody.” Thank you for sharing Ramana’s wisdom.